Coxreels EZ-T Safety Series truck mount spring driven hose reels feature Coxreels patented EZ-Coil controlled retraction. 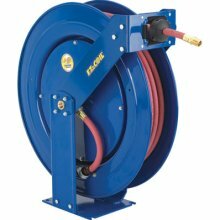 EZ-Coil retracts up to 80% slower than conventional spring driven retractable hose reels to promote operator safety and hose reel longevity. Like the T Series, the extra large chassis is strongly supported by dual pedestal-style arms that span from the roller guide bracket down to the sturdy mounting base. Triple support points to the center shaft are complimented by Coxreels original Super Hub support system. EZ-T series hose reels are available in low, medium and high pressure for use with fuel, air, water, oil, grease and other fluids. Check out all of out air fittings that will fit with the Coxreels perfectly! All Coxreels are built to order, please allow 2-3 weeks for delivery. EZ-T SERIES: Dual Pedestal-Style Support Arms & Base Triple Axle Support Points To The Center Shaft With Coxreels’ Original Super Hub Axle Support System Built For Rugged Mobile Applications Swivel Seals: NITRILE Reduced Retraction By Up To 80% SPRING DRIVEN FEATURES: &n..
All Coxreels are built to order, please allow 2-3 weeks for delivery. EZ-T SERIES: Dual Pedestal-Style Support Arms & Base Triple Axle Support Points To The Center Shaft With Coxreels’ Original Super Hub Axle Support System Built For Rugged Mobile Applications Swivel Seals: NITRILE Reduced Retraction By Up To 80% SPRING DRIVEN FEATURES: A..